“We are a team that is capable of songwriting, composing and creating choreography. 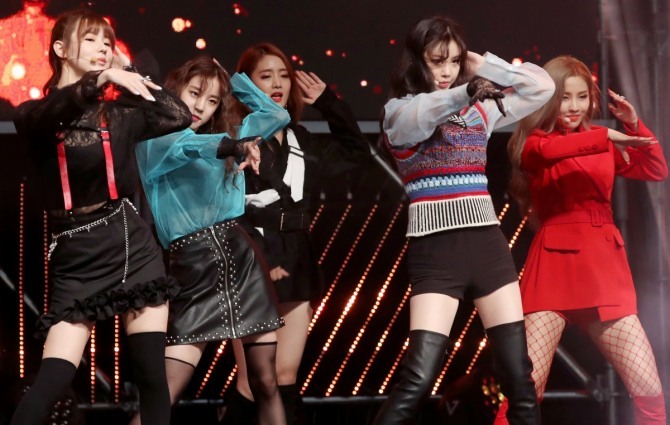 We can offer fans the best performance as we know each other’s strengths well,” said Miyeon during the group’s debut showcase for “I Am” in Seoul on Wednesday. The group’s unusual name, which means “girls” in Korean, refers to a group that has six members with different personalities, explained Soyeon. The debut EP “I Am” is led by the moombahton-inspired “Latata,” for which Soyeon lent her hand in both composing and writing. Featuring the members as passionate women wanting to dance through the night for their love interests, the propulsive song is also reminiscent of co-ed K-pop act KARD’s stereotypical Latin-inspired dance music, heavy with traps synths and groovy beats. “I thought about each member while writing this song. I think it suits us well,” said Soyeon, who has participated in writing another four songs in the album. The members also shared their journey towards becoming K-pop stars. Yuqui said she dreamed of becoming a K-pop musician after watching a stage performance by HyunA, the group’s label mate, while Minnie said she had wanted to become a musician since she was five when she began learning to play the piano. “It’s been two years since I lived with my bandmates, and now we can tell what each other is thinking just by looking into each other‘s eyes,” Yuqui said. The act said its goal for this year is to promote the group with eyes on a rookie award.